Scooby-Doo! 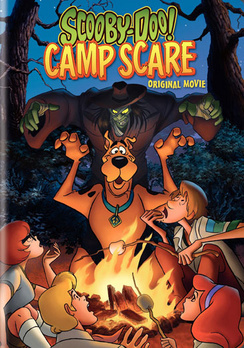 Camp Scare is a 2010 direct-to-DVD animated comedy horror-mystery film based upon the Scooby-Doo Saturday morning cartoon, and was released on September 14, 2010. The film was released seven months after the release of Scooby-Doo! Abracadabra-Doo. The 15th direct-to-video Scooby-Doo film, the movie sold 53,389 units in its first week and as of January 2013, it has sold approximately 194,000 units. Scooby-Doo and the gang travel to Camp Little Moose, Fred's old summer camp, to vacation and serve as camp counselors. However, on arrival they find the camp empty, except for Burt, the head counselor, and the local Forest Ranger, Ranger Knudsen. They discover that one of the camp's old legends, the Woodsman, a cruel counselor who went insane after a prank set up by his campers went awry and left him with severe brain damage, has come to life and scared the kids away. Ranger Knudsen suggests Burt close the camp before leaving. Burt is about to listen to the Ranger's advice when three kids, Luke, Trudy, and Deacon, arrive at the camp. Fred convinces Burt to keep the camp open until the Mystery Inc. gang discovers what is going on. But the gang and the kids are soon attacked by the Woodsman. The next day, everyone decides to spend the day at Big Moose Lake, home of the rich and modern Camp Big Moose. While enjoying their time at the lake, they are attacked by the Fishman, another camp legend about a lonely kid who spent so much time swimming in the lake caused him to turn into a half-man half-fish monster, that has also come to life. During the chase, Scooby-Doo discovers a building at the bottom of Big Moose Lake. That night, Jessica, Camp Big Moose's head counselor, asks the gang if Camp Little Moose is pulling a prank on Camp Big Moose, explaining that an RV and some sonar equipment are missing from the camp. The gang wonders what purpose the equipment would serve for the Woodsman or the Fishman. Velma uses the RV's tracking device to locate it to Shadow Canyon, where (as Burt explains) the Specter, another camp legend about a lost hiker who's soul is still looking for a way out of the canyon with a deadly scream, resides. Everyone splits up; Fred, Daphne, Jessica, and Luke go investigate the building under Big Moose Lake, and Velma, Shaggy, Scooby, Burt, Trudy and Deacon head to Shadow Canyon. After being chased by the Fishman, Fred and the others discover a whole town under the lake, as well as some dynamite hidden in a cavern. Velma and company discover the missing RV and sonar equipment in Shadow Canyon and find that the sonar equipment is being used to scan the lake. Then, they are chased away by the Specter. Everyone meets back at Camp Little Moose to go over what they found. Deacon decides he has had enough and wants to go back to Camp Big Moose, and Jessica drives him. The Mystery Inc. gang decide to ask a local shop owner about the underwater town. He explains that it was a mining town called Moose Creek, that was forced to be evacuated to create the dam and Big Moose Lake. More importantly, the treasure of a notorious gangster named Ricky LaRue is said to still be buried there. Before his death, the gangster had told his cellmate, Baby-face Boretti, that when the sun hits the town steeple on the Summer Solstice, the location of the treasure would be revealed. The gang reasons that the dynamite will be used to destroy the dam and reveal Moose Creek in order for the monsters to find the treasure, as the next day is the Summer Solstice. But doing this would flood Camp Little Moose. The gang returns to the camp to find that the Woodsman has laid waste to it, but Burt, Luke, and Trudy are safe. The gang realizes that if the Woodsman found the camp unoccupied, he would be free to destroy the dam. The dam then explodes, and everyone narrowly escapes. The gang goes to Moose Creek, now exposed, to explore. There they find Jessica, who explains she was following Deacon. They are then attacked by the Fishman, who chases Fred, Jessica, and Luke. The rest are found by Deacon, who, after locking them up, reveals that he is in fact Baby-face Boretti, who escaped from prison two months prior, and is looking for the treasure. After a long chase, the Fishman is caught and revealed to be the Woodsman. They unmask it again and it turns out to be Ranger Knudsen, who posed as the Woodsman, the Fishman, and the Spectre. The gang also capture Baby-face Boretti, who tries to escape with the treasure. Velma explains that Boretti and Knudsen teamed up to scare away the kids at Camp Little Moose, explode the dam, and take the treasure. When the Mystery gang arrived, Boretti posed as Deacon to try to convince everyone to leave and the two used the sonar equipment to search for the town under the lake. In the end, Boretti and Knudsen are arrested; Burt and Jessica merge the camps to form Camp Little Big Moose at Moose Creek, and the Mystery Inc. gang serves the remainder of the summer as camp counselors. In a post-credits scene, it is revealed that the Spectre is actually real. An EP soundtrack for the film was released exclusively to iTunes Stores in the US on September 14, 2010. Scooby-Doo! Legend of the Phantosaur was released on September 6, 2011. ^ a b "Scooby-Doo! Camp Scare". 14 September 2010 – via Amazon. ^ "Scooby-Doo! Camp Scare". Retrieved 2 November 2014. ^ "Scooby Doo! Camp Scare (Music from the Original Movie) - EP by Various Artists". 14 September 2010.